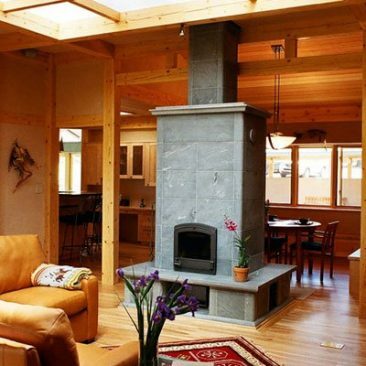 A masonry heater allows you to heat your home with wood in a unique way. The main thing that distinguishes a masonry heater from other wood-fired heating appliances is the ability to store a large amount of heat. This means that you can rapidly and cleanly burn a large charge of wood without overheating your house. 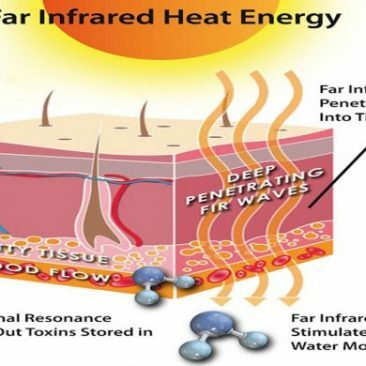 The heat is stored in the masonry thermal mass, and then slowly radiates into your house for the next 18 to 24 hours. If you burn wood fairly rapidly, it is a clean fuel. If you try to burn it too slowly, the fire will change from flaming to smoldering combustion. The burning process is incomplete and produces tars. Atmospheric pollution increases dramatically. This is important if you are planning an energy-efficient house. The average energy demand of your house will be quite low. For most of the time, it may require only 1 to 2 kW of heat. 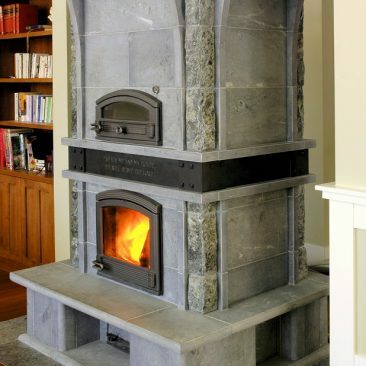 For most conventional wood stoves, this is below their “critical burn rate”, or the point where they start to smolder. Masonry heaters fill the bill perfectly. If you need even a very small amount of heat, such as between seasons when you simply want to take off the chill, you simply burn a smaller fuel charge yet you still burn it quickly. The large surface is never too hot to touch. You have a premium radiant heating system with a comfort level that simply cannot be equaled by convection or forced air systems.